LES.NET utilizes its own private Dark Fibre Optic Network to deliver blazing fast Internet in Winnipeg. In addition to this fibre optic network, we operate 6 wireless points of presence through the city. 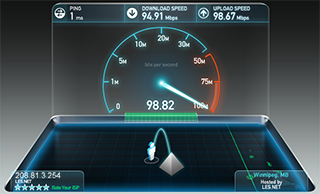 Service is available at 100 Megabits, 1 Gigabit and 10 Gigabits. LES.NET is proud to offer internet services that break boundaries that other companies only promise. Our services are symmetrical, so that upload and download are the same. A necessity for two way conversations, or utilizing cloud services. Gone are overage fees. LES.NET provides ALL your data in the monthly price. 100 Megabit service starts at $199/Month, and Gigabit at $599/Month. Dollar for dollar, our fiber based internet services are 1/5th to 1/10th the cost of the competition. Direct Interconnects to our network are also available at 3 data centers in Winnipeg, or inquire about a custom fibre build to your location. Locations outside our fiber optic foot print are available at speeds of up to 750 Megabits using advanced microwave point to point links. For any questions regarding our pricing plans above, don’t hesitate to contact us.